There are few things more irritating than getting water in your ears. Nobody likes the feeling of water trapped in their ears. It’s uncomfortable, can impede your hearing, and cause other unpleasant sensations. Water stuck in the ears also produces a sloshing sensation or sound, which can also be annoying. After swimming, bathing, or playing in a pool, it’s not uncommon to have water trapped in your ear, especially if your head was submerged. It can affect anyone. What some people don’t know is that water in their ears can also lead to serious medical problems if left untreated. This is why learning how to get water out of your ear is very important. Is Water in the Ear Serious? If you’ve got water in your ear canal, you’re likely to dismiss it as an annoyance or a minor problem. But when water is left in your ear, it can cause inflammation and pain, often referred to as “Swimmer’s Ear.” Inflammation of the ear drum can eventually end up causing permanent hearing loss or damage. Furthermore, if the water trapped in your ear is dirty or contains bacteria, then you can develop an ear infection, which can also cause pain, discomfort, and hearing loss. Despite these serious symptoms, there’s no need to panic when water becomes trapped in your ear. As long as you drain your ears of the fluid, you aren’t likely to develop an infection or suffer hearing loss. Wetness inside your inner ear. Exposure to water (taking a shower or swimming in a pool) is the most common cause of these symptoms, but if you weren’t in water and still experience them, it could be the sign of another medical issue, such as an ear infection. It may feel like there’s water in your ear, but that doesn’t necessarily mean there is any. When there’s fluid in your ear, you want to avoid getting an infection or sustaining damage. That’s why getting water out of the ears is important. Luckily, it’s also easy. There are variety of remedies, treatments, and methods that are effective for removing water from your ear. 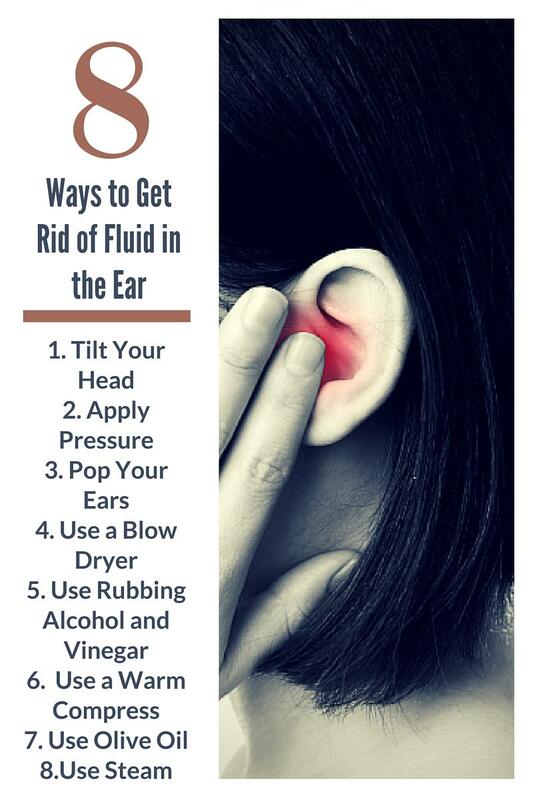 Often, there is no need for a doctor; the easiest methods for how to get fluid out of your ear can be done at home, safely and quickly. The easiest way to remove water from your ears is to use gravity. That is, by tilting your head, the water in your ear will often drain out on its own. Sometimes, water is in your ear canal, but it’s not really stuck there. By pointing your clogged ear towards the floor, the water can eventually drain and work its way out. Sometimes, this can take a couple of minutes. Of course, if you tilt your head in the wrong direction, with your ear facing up, water can go further into your ear—you don’t want that. Sometimes, gravity isn’t enough. Another way to get rid of fluid in the ears is by using pressure and creating a vacuum in your ear canal. With your head tilted to the side, you can press, push, or cover your ear with your hand, which will help create a vacuum. Remove your hand quickly, and the trapped water may drain. As well, gently tugging on your earlobe can sometimes open up your ears enough to allow the water to come out. Another effective way for removing water in your ear drum is by “popping” your ears. The Valsalva maneuver can help you with this. To use this maneuver, simply plug your nose and then attempt to blow out of it—gently! You don’t want to rupture your ear drum! The pressure will result in your ears popping, which means the Eustachian tubes in your ears have opened. Water may now be removed from your ear. One way to remove water in your middle ear is by using a blow dryer. Warm air creates water vapor, which is why the heat from a blow dryer can sometimes work to remove trapped water. Simply take a blow dryer, put it on its lowest setting, and hold it about one foot from your ear, blowing directly inside. Alternatively, you can pass the air across your ear rather than directly into it. After a few minutes, water may begin to drain from your ear. Be careful not to use a high setting, as that can burn your ear. And don’t touch the dryer to the skin of your ear. One home remedy for water in the ears is a mixed solution of 50% rubbing alcohol and 50% vinegar. Mix these ingredients and put them into an eye dropper, then put a few drops into your clogged ear and tilt your head for relief. This home remedy can be very effective in removing the water. The acid in the solution helps break down ear wax, which may be helping to trap water in your ear, and the alcohol can help evaporate the water. Vinegar also has antibacterial properties, which can help kill off bacteria and germs. When using a solution like this, it’s important to take some precautions: don’t use more than a few drops, don’t leave the solution in your ear without draining it, and don’t use it if you have a punctured ear drum or pain from water in the ear. Another way to open up the Eustachian tubes in your ear is to use a warm compress. Soak a cloth in hot water, wring it, and then hold it over your affected ear. Be sure to tilt your head toward the ground, or you could end up pushing the water further into your ear. Another remedy for water in the ear is to use a few drops of olive oil with an eye dropper. Olive oil has many effects: it can help break down ear wax and it has antibacterial properties that can kill off germs. Leave it in for 10 minutes before attempting to drain. Inhaling steam is another way you can open up your Eustachian tubes and allow water to drain. Simply pour steaming water into a bowl, then place a towel over your head, lean over the bowl, and inhale slowly for 10 minutes or so. The steam will open up your Eustachian tubes and help push the water out. Alternatively, you can take a hot shower or a steam bath for the same effect. Pressure in your ear canal. Ear infections can be serious and may lead to permanent hearing loss or other damage. See your doctor and ensure that you don’t suffer any serious health effects. Don’t let clogged water turn into an ear infection—keep your ears clean and dry!